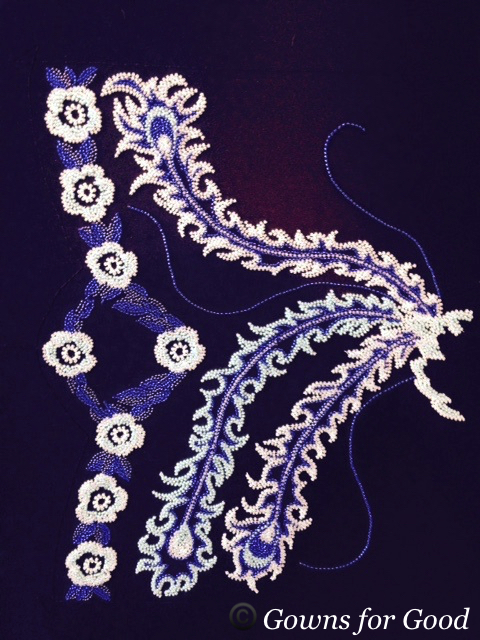 I’m an embroideress, always have been, and always will be. Embroidery was my very first passion. Even my pram blanket was hand embroidered. I had lots of craft influences as a child, painting, sewing etc but embroidery was the craft that I always came back to and am still consumed by. I went to grammar school in Hackney, London and had the luck to be given the opportunity to study embroidery at ‘O’ and ‘A’ level. That was it; I am still totally in love with the craft. I had a very inspirational teacher who was a member of the embroidery ‘62’ group. She was an embroidery expert. I learnt all the traditional techniques, Patchwork, Drawn Thread, Broderie Anglaise, Quilting and many more. I covered the crafts from a traditional perspective and then was encouraged to create and develop those techniques in a contemporary art form. I lived it and still live and breathe embroidery. Then I was introduced to tambour bead embroidery. Tambour embroidery was and still is practiced in many places around the world. 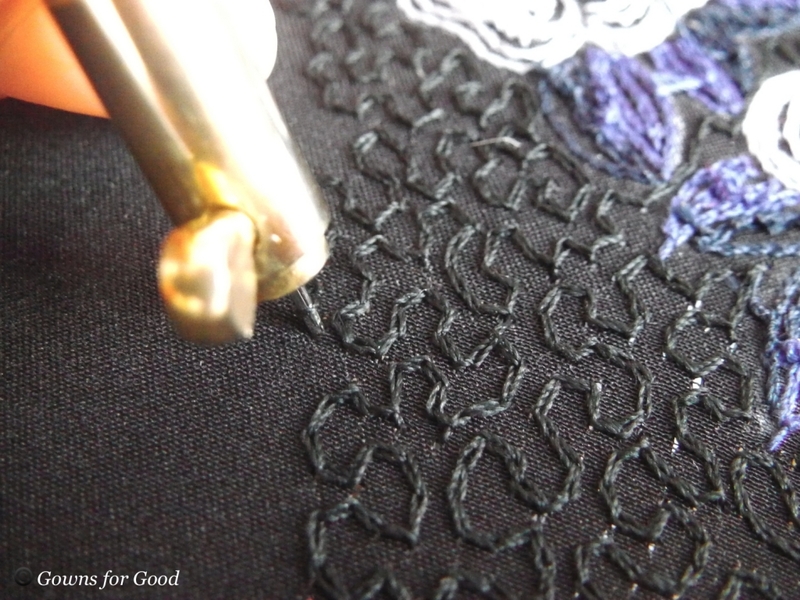 Primarily the tambour hook was used to produce a regular embroidered chain stitch for surface decoration. The tambour hook is used to produce needle made lace such as Coggeshall lace, Lier and Limerick lace. 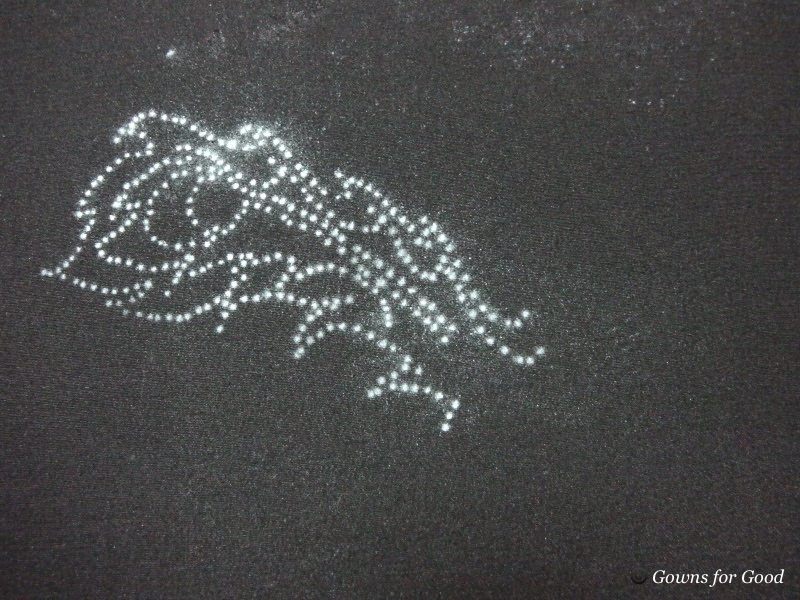 In the mid 1800’s, Louis-Bonnechaux Ferry an embroidery workroom manager in Luneville in France discovered that the technique could be used to apply beads and sequins. 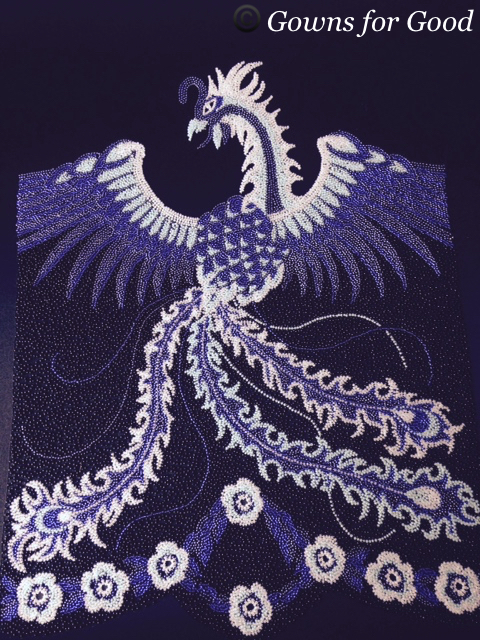 Many of the embroiderers who worked producing surface chain stitch embroidery and needle made lace were then able to apply their skills to produce bead and sequin embroidery. Tambour is the technique of choice for surface decoration for costumiers and couturiers as it is speedy and results in precise design lines. For the artisan embroiderers who produce tambour beaded and hand embroidered garments things have changed little over the centuries. The technique hasn’t altered; the frames and hooks are the same but most importantly the work involved in embroidering a couture gown or costume turns an artfully designed dress into a luxurious, never to be forgotten sumptuous event. 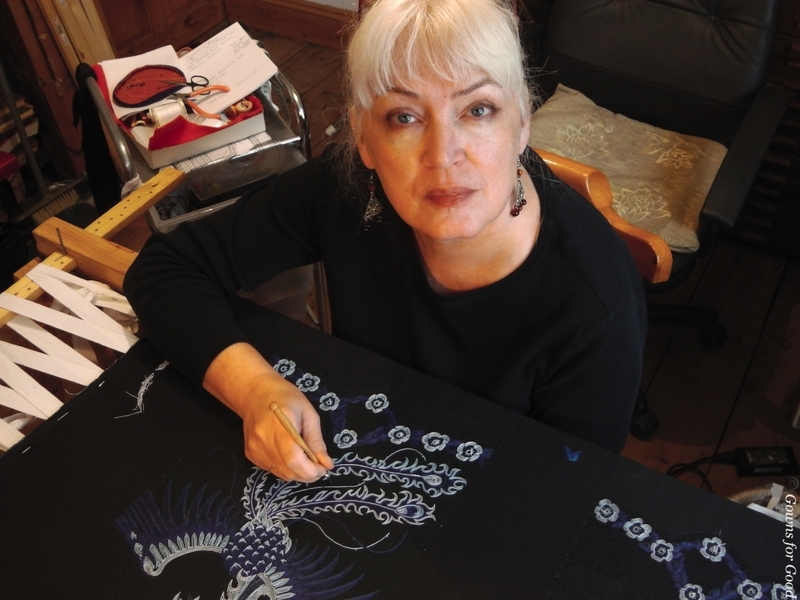 In the late 1970s friends that I studied embroidery with set up a company just off Carnaby Street called Spangles, specialising in bead embroidery for couture and costume. Initially I worked for Spangles and gradually developed my own client base. It paid well and I was able to work from home and schedule my day around my children. It was often very hard work but it was and still is interesting, inspiring and rewarding. 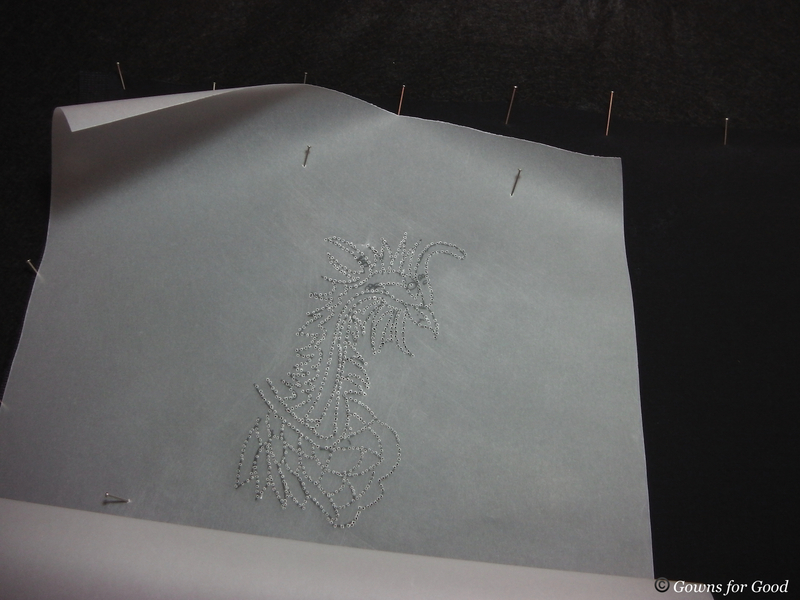 As a tambour bead embroiderer I work on the fabric before it is cut. 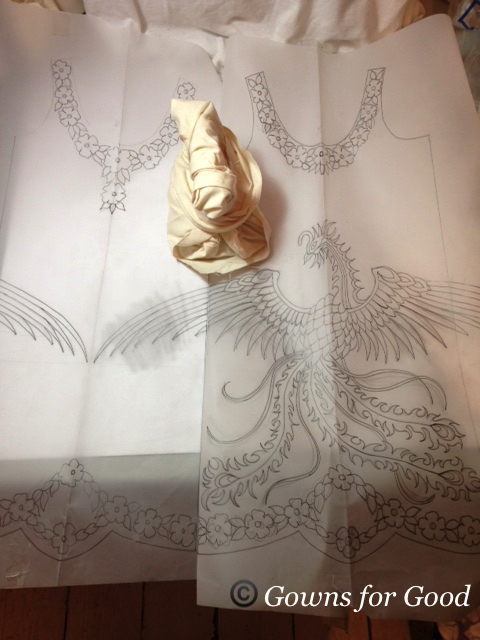 The fabric arrives from the designer with the pattern garment marked on to the back of the fabric. I put the fabric into a large slate frame and work the embroidery and then it is returned to the workroom to be cut and finished. 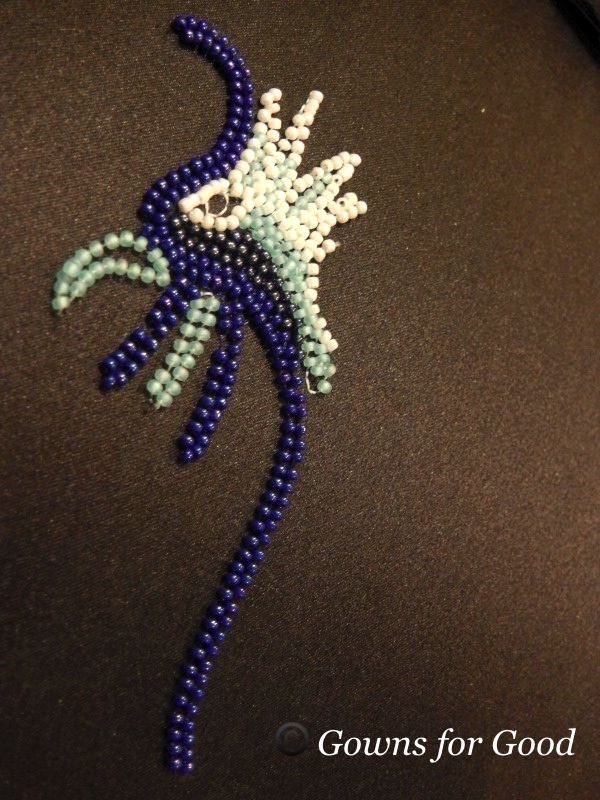 Tambour bead embroidery is worked from the reverse of the fabric. 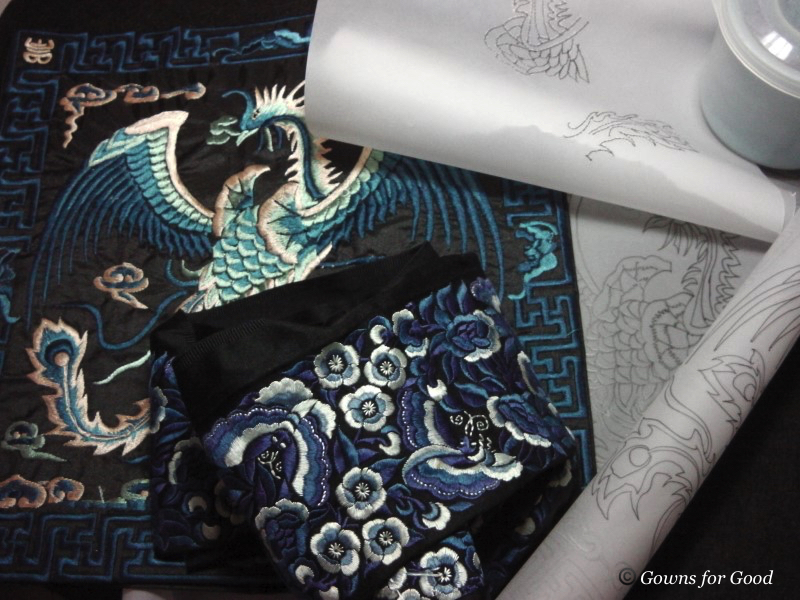 The embroidery is designed and the design is then applied to the wrong side of the fabric. The fabric is framed with the wrong side uppermost in the slate frame. The slate frame sits between two trestles. 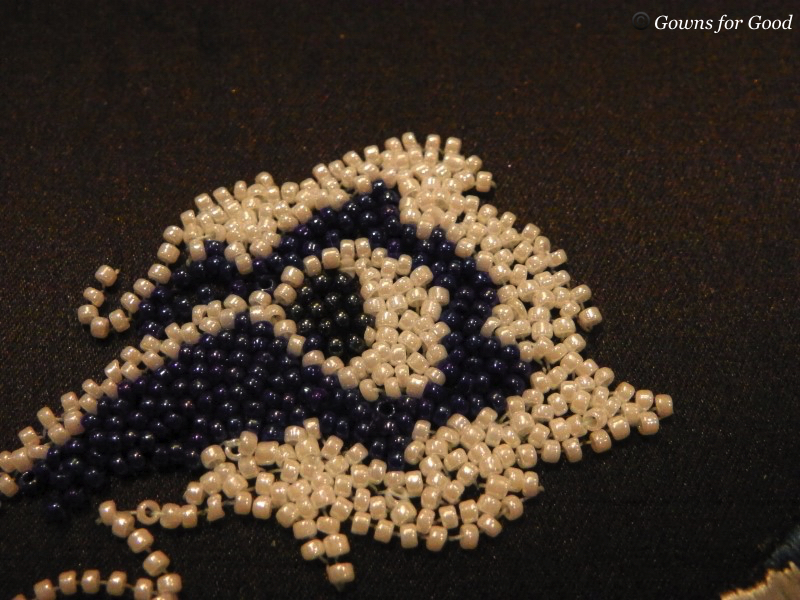 My dominant hand is on the upper side of the frame holding the tambour hook and my other hand is underneath the frame manipulating the beads and sequins into place. 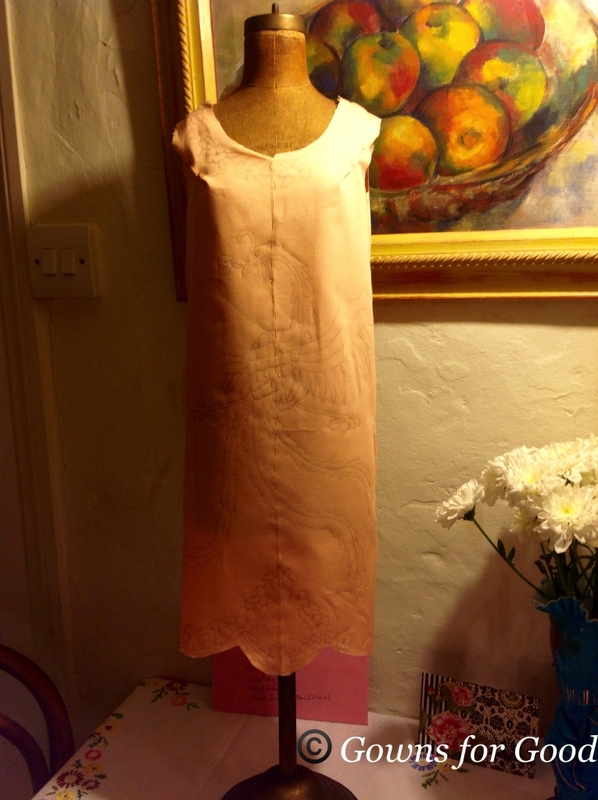 Tambour can be worked on any fabric from organza through to leather although lycra can be a bit of a challenge. The business grew and grew and I worked with a team of beader colleagues including my daughter Sarah. I was lucky in that I got to meet so many designers both for costume and couture and worked on some very interesting pieces right across the range from ready to wear for Nicole Farhi at French Connection, sample work for mass production, to high end couture for designers like Bruce Oldfield and the late Hachi, one of Princess Diana’s favourite designers. Elton Johns 50th ‘Birthday Suit’ for designer Sandy Powell had lots of diamante bling. 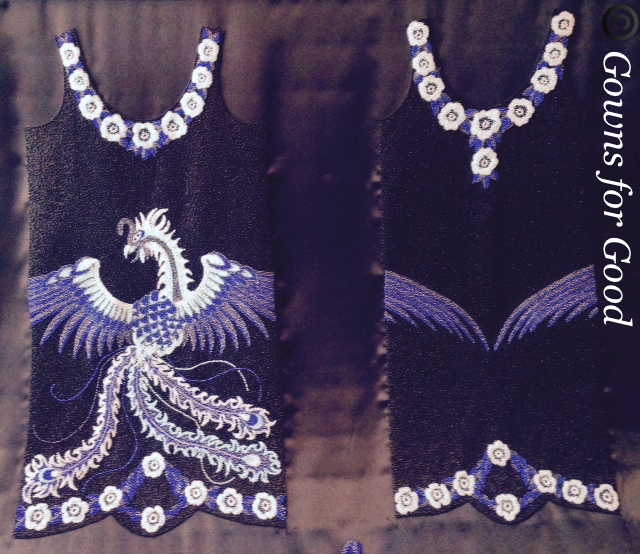 Embroidery for Michelle Yeo in the Bond movie Never Say Never was an interesting serpent shaped neck detail. A few little pieces for Four Weddings and a Funeral were nice to be involved with. Michael Flatley’s celtic knot designs on leather were very interesting pieces to work on. 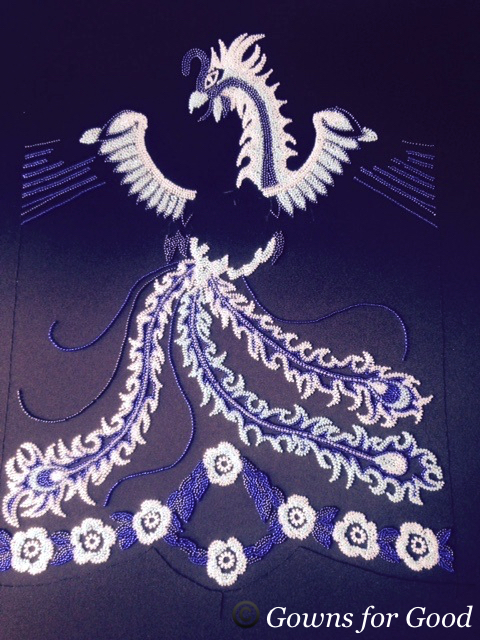 The costumes for stage productions were the most challenging as there was often a huge amount of beading to be completed in a very short time which took a lot of coordinating. I suppose the costumes for Sunset Boulevard, designed by Anthony Powell, were the most intense, one dress took over 300 hours to embroider. 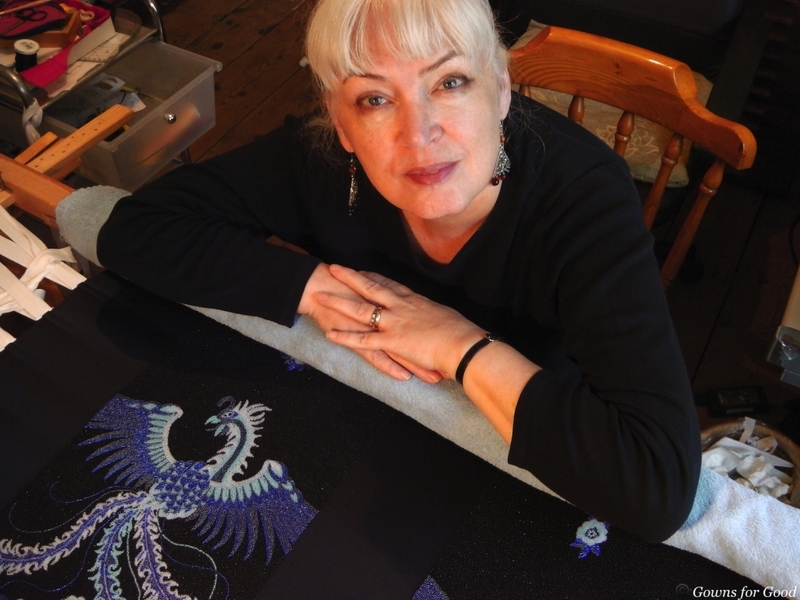 I now concentrate more on teaching tambour beading and tambour embroidery I teach one to one in my own home or I teach in the students own home or to groups for instance a tutu seminar in Nottingham and taster workshops in Scotland. For the last three years, I have been invited to teach in Australia. I teach the advanced couture students at The Melbourne Fashion Institute and the members and guest students at the Melbourne Embroiderers Guild during September and October. I meet some very remarkable students and it is very inspiring and rewarding to be able to pass the craft along to others. I learnt tambour in the mid 70’s and all these years later I am still working on new ideas. I sometime dream new techniques and wake next morning and rush to try them out. The craft is limitless. Just the elements used give a huge variety of design possibilities. The multitude of fabrics, the fantastic variety of threads, the limitless array of beads and sequins coupled with the design possibilities whether you are working on the flat or in three dimension, mix all of that with your own imagination and a world of design inspiration and tambour bead embroidery and embroidery becomes such a very exciting beautiful craft….and that is just the beginning.